Background photo: This aerial image of the Earth taken from a high-altitude balloon shows major land features. Courtesy N.C. Space Grant. Top left: Sarah Poulin, left, and Anna Windle display some of the drones they used to collect data on oyster reef health. Windle was a 2017 North Carolina Sea Grant – North Carolina Space Grant Graduate Research Fellow. Courtesy Anna Windle. Bottom right: A researcher prepares an unpiloted submersible for use. Courtesy N.C. Space Grant. Updated Sept. 18, 2018: The application deadline has been extended from Sept. 21, 2018 to Oct. 5, 2018. 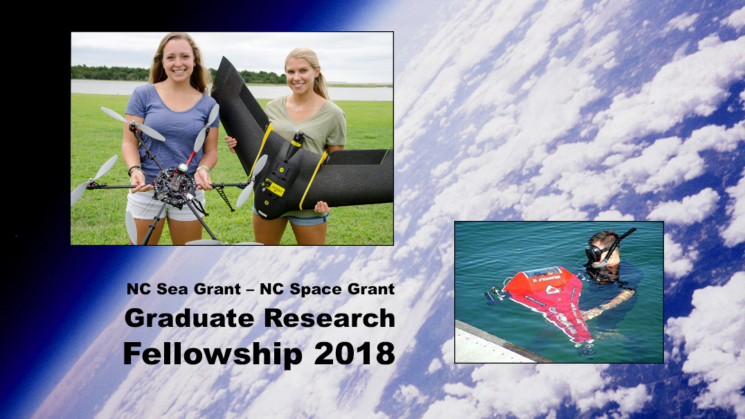 North Carolina Sea Grant and North Carolina Space Grant are inviting applications for their third joint Graduate Research Fellowship Program. The selected fellows will focus on nearshore environs and coastal watersheds. Proposed projects should apply relevant measurement instruments and/or remote-sensing data sources from the National Aeronautics and Space Administration (NASA), National Oceanic and Atmospheric Administration (NOAA) or other data sources. “We are excited to offer this student fellowship again,” notes Susan White, North Carolina Sea Grant’s executive director. White is also the North Carolina Space Grant director. This opportunity is open to full-time graduate students who are enrolled at accredited colleges or universities within North Carolina and are U.S. citizens. The application deadline is 5 p.m. Friday, Oct. 5, 2018. The programs anticipate offering up to two 12-month graduate fellowships for the 2018–2019 academic year. Each fellow may receive up to $10,000, subject to the availability of funds. The proposed research must be supervised by a faculty mentor and completed no later than Dec. 30, 2019. For the full RFP and detailed instructions, visit the Fellowship page on the Space Grant website. This fellowship is supported by North Carolina Space Grant in partnership with NASA, North Carolina Sea Grant in partnership with NOAA and the State of North Carolina.